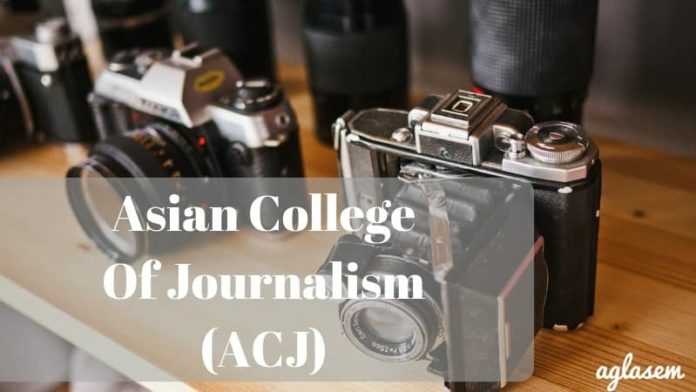 Asian College of Journalism (ACJ) Entrance Exam 2020 will be conducted by the Asian College of Journalism. 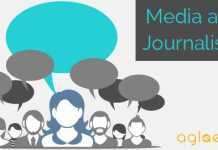 This entrance exam is conducted annually for granting admission to students who wish to pursue their post graduation diploma course from the Asian College of Journalism (ACJ). 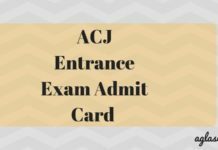 The entrance exam for ACJ will be conducted in the month of May 2020. Candidates who wish to appear in the common entrance examination need to register themselves for the examination before the last scheduled date. Candidates can get complete details about the Asian College of Journalism (ACJ) Entrance Exam 2020 on this page below. The table below comprises of the important events and their expected schedules for the Asian College of Journalism (ACJ) Entrance Exam 2020. Candidates can refer to the table below to get a brief idea about the timeline of the ACJ 2020 admission process. A Bachelor’s Degree is mandatory. Graduates in any discipline and students awaiting their degree examination results are eligible to apply for admission to the ACJ. Enrolled students should provide their degree certificate to the Registrar within the first week of commencement of classes. Students awaiting their examination results should provide their degree certificate latest by the end of February 2021. Candidates who wish to get admission in Asian College of Journalism (ACJ) and want to appear for the ACJ 2020 entrance exam need to fill the application form for the exam. The application forms will be available in both the modes (online or offline). The online form will be now available on the official website & the same will be also available in the “Application form” page. Students who fill their application in offline mode need to download the application form from the official website and then fill in all the required details. Candidates who have submitted their application forms successfully before the last scheduled date will able eligible to download their admit cards from the official website. The admit card is an important document that contains important information about the exam as well as the candidates. 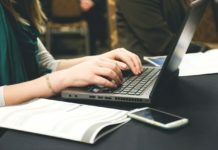 Shortlisted candidates will receive an email regarding their hall ticket in the month of May 2020.
candidates will be given a topic for essay writing in which they will have to write an essay of approx 200 words. Interview: Candidates who will be shortlisted after the entrance examination will then be called for the next round that is the personal interview at the college campus. The candidate who will be qualifying the interview will be given admission. The examination will be conducted in various test centers throughout the country. Here we mention the last year exam center for reference only. Note: Thiruvananthapuram and possibly other cities, depending on the number of applications received from a particular region. The results will be uploaded on the official website. The official examination body will be published the list of selected candidates with their names and the specialization they have been shortlisted for. Candidates are advised to check result carefully and save it for the further use in the admission process. The fee for the Post Graduate Diploma programme will be divided into two installments to be paid by the candidates in the month of June after the commencement of classes. Along with the fee given below candidate will have to pay 18% Goods and services tax (GST) as per last year.